Djenné did not really welcome us; a flat tyre, disappearing daylight and a mass of children demanding gifts. 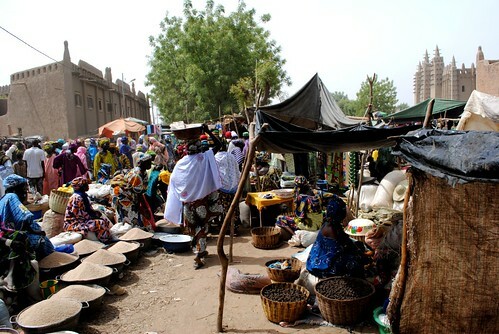 After a tough day of bum adjustment back on the bicycles we crashed early and limited ourselves the next day to market-and-mosque-meandarings only (after our rushed exit from Bamako we still had a mountain of bike jobs left to do!). 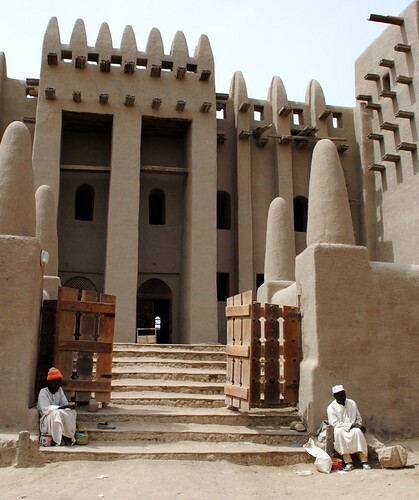 Djenné’s history is rich and colourful, between the 15th and 17th century it was an important town of the trans-Saharan trade route. Centuries ago precious goods such as gold and salt passed through this town. Now in the aftermath of its economic decline the tourists are the most precious things passing Djenné’s narrow lanes. 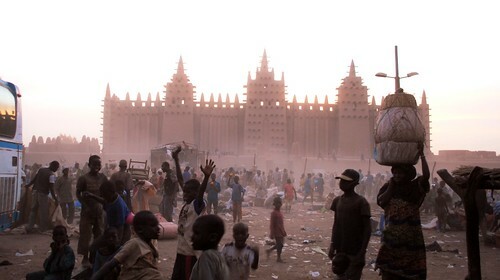 But whilst the impact of tourism shows its irritating face, the city’s Sudanese- style architechture remains beautiful, particularly the Grand Mosque; a sun-baked mud brick structure with smooth curves, touched only by the annual rains after which the whole community works together to restore the structure to its former glory. Now we have reached Sévaré, 120 evil, hot, sandy, unforgiving desert kilometers from Djenné. Here we hoped to hear good news on the military mutiny and civil unrest in Burkina Faso. But just three days from Burkina Faso’s border we hear mostly bad reports and new warnings against the route. In what will be our last internet stop before passing the frontier and with only three days to go it seems we have some big decisions to make. Mikaela’s Shimano shoe gets stuck to her pedal! 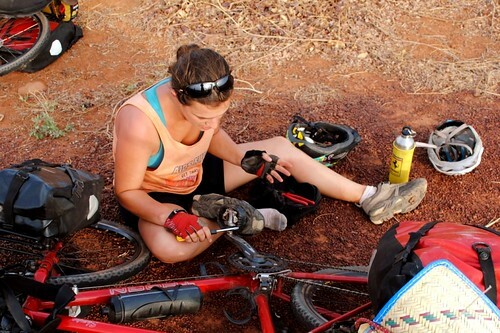 This entry was posted in Cycling, Planning, Politics, Travel, Uncategorized and tagged Burkina Faso, burkina faso military, Burkina faso mutiny, cycling, djenné, djenné grand mosque, mali, mopti, sévaré. Bookmark the permalink. Pingback: Quickie: Overpopulation blasts the landscape | Up & Down Like the Assyrian Empire!